As I began my search to learn a little more about the food culture of the county I live in and now call home, I quickly realized that Wake County functions as a “melting pot”. While researching Forsyth and Lenoir counties, I zeroed in on a specific recipe that was near and dear to locals I spoke with. This wouldn’t be the case for Wake County, as it’s the capital and a collaboration of natives, re-locators and college students. I wasn’t sure how I was going to define a food or recipe to cover this expansive county. My adventure started by reading an article in Our State magazine detailing North Carolina State University’s Howling Cow Ice Cream. Reading about the creation of this delightful treat lured me over to Talley Market on N.C. State’s campus to taste it myself. Gary Cartwright who is in charge of the Dairy Enterprise System at N.C.State was quoted in the article stating, “It makes people smile.” True indeed! So true I felt compelled to write a post about it. This ice cream has become so popular that it attracts North Carolinians to trek across the state and indulge in this heavenly dessert at the annual State Fair. After learning this I knew I wanted to incorporate this fresh, local ice cream into the recipe for Wake County. 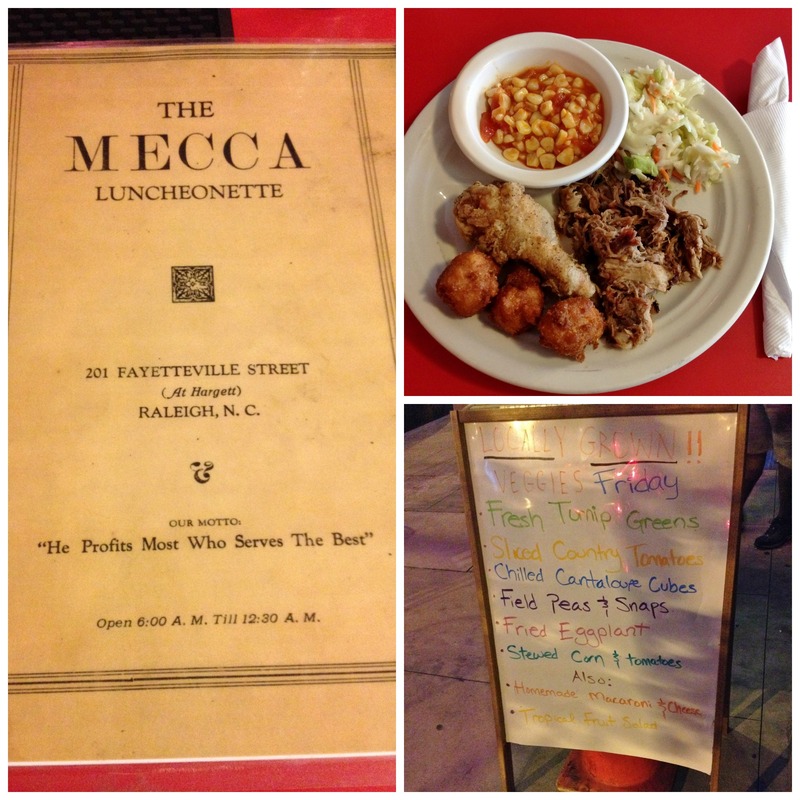 While I continued my search in discovering the food culture of Wake County, I visited a couple of downtown venues, one being The Mecca Restaurant. This establishment was founded in 1930, relocated to it’s current location in 1935, and has been family owned while serving fresh veggies from the City Market ever since. While sampling a plate of fried chicken, Eastern NC BBQ, fresh veggies and blueberry cobbler, I spoke with John, a fourth generation Dombalis, regarding the family business and how he witnessed Wake County’s food culture evolve through the years. 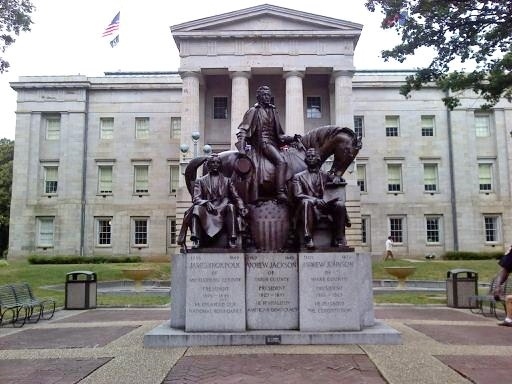 The weeks flew by as I visited Raleigh’s Visitor Information Center, Cameron Village Regional Library, Meredith College Library and savored a wonderful lunch with a Meredith College Alum at Side Street Restaurant in Raleigh’s Historic Oakwood neighborhood. 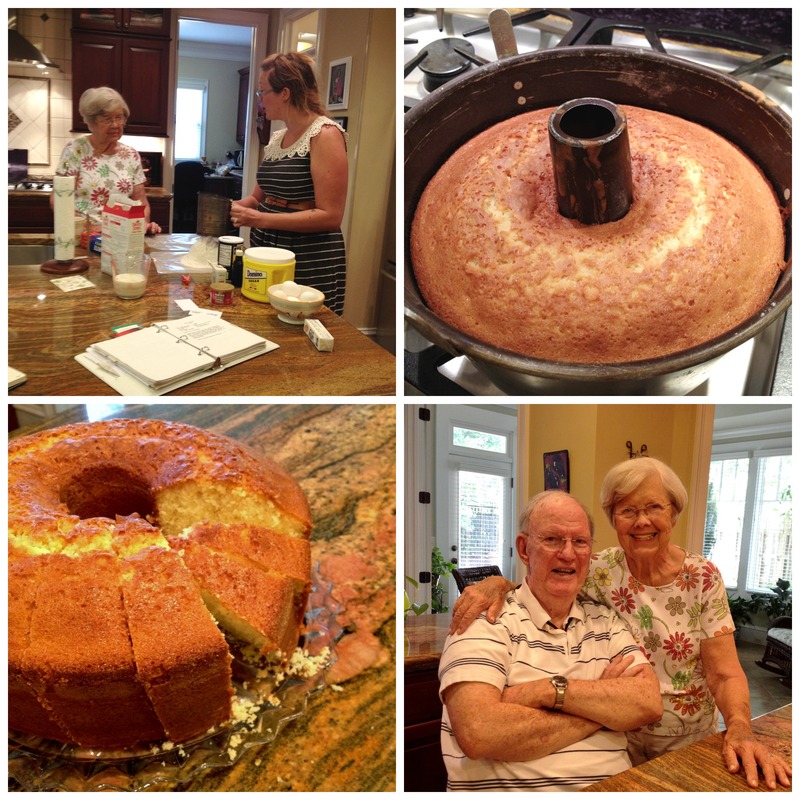 I then had the wonderful opportunity to meet Elena in Raleigh to learn a little more about the Southern classic dessert, Pound Cake. Elena’s grandmother’s brother, Ted, and his wife Ann opened their kitchen to us and helped us prepare an 100 year old pound cake recipe from Nanny, (aka Flossie), Ted’s mother. Ann and Ted told stories from moving around this great state of North Carolina and residing in Wake County. They shared pictures of their family tree and how they have family ties to North Carolina State University and Meredith College. Most importantly we learned how the pound cake was made “just right” and how it became a treasured family recipe. After weeks of contemplating about a recipe choice for Wake County, I finally made up my mind. 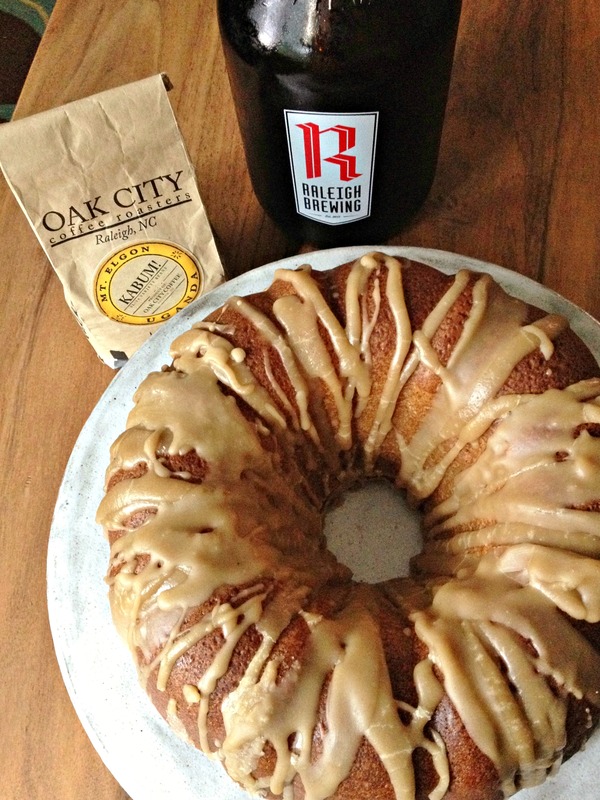 The pound cake was going to serve as a representation of Wake County’s “Melting Pot”. This meant I needed (and wanted) to obtain as many local ingredients as I could, while adding a little twist to Nanny’s recipe. Presently, Wake County has exploded with craft breweries while local coffee roasters are making their stance as well. Incorporating Wake County’s past food culture along with it’s present food culture was an important aspect I wanted to instill for this recipe. 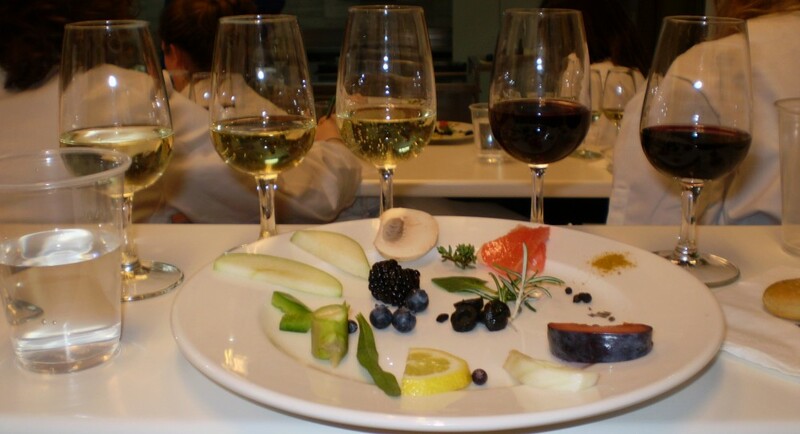 Using local ingredients is ever so important to me, personally and professionally. So, as you can imagine, going around and collecting eggs from Wake County residents’ backyard chicken coops (with permission!) was certainly not out of the question. Making phone calls to find Wake County butter, flour, spices, beer and coffee was quite successful, as I put together a “farm-to-table” version of this classic Southern recipe. Not only were the cake ingredients from Wake County, but to my delight, I came across a beautiful cake stand at the North Hills Farmers Market in Raleigh which was crafted by a Wake County potter. 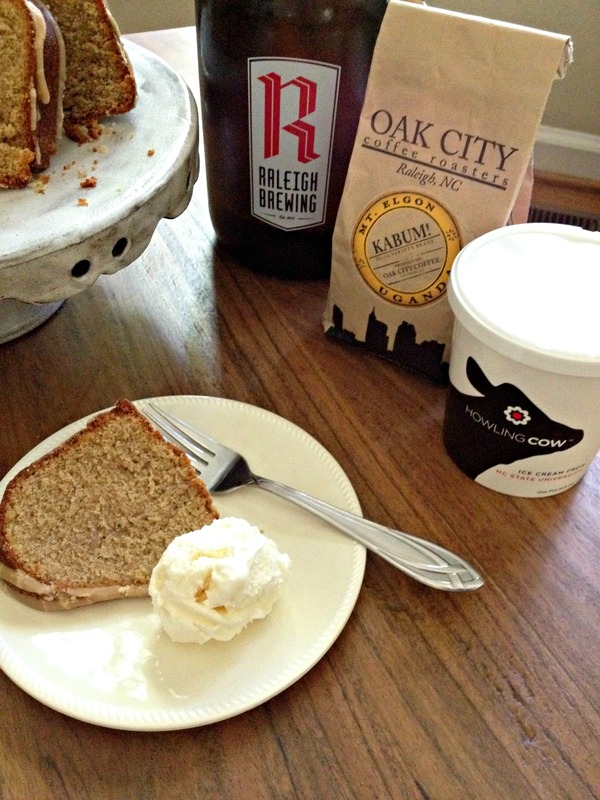 As I wrapped up research for my “home” county, I couldn’t help but smile as I indulged in a scoop of Howling Cow’s Vanilla Ice Cream and a slice of Wake County Coffee Porter Pound Cake. My hope is that this recipe makes natives proud and eager to incorporate new ideas from the current and ever-changing food culture into classic family favorites. Move oven rack to center of oven and preheat to 325 degrees F. Grease and flour a 10 inch bundt pan thoroughly. Cream butter in large bowl with electric mixer at medium speed until very light and fluffy, scraping bowl often with spatula. Add sugar and continue creaming. Add eggs, one at a time, beating well after each addition. Combine baking powder, salt and mace in bowl with 3 cups of sifted flour, stirring to combine. Combine beer, coffee and vanilla in bowl and mix together. Alternate beer mixture and flour mixture, beating well after each addition. Add the 1/2 cup sifted flour last of all and mix until blended. Pour batter into pan, pound gently on counter top to release air bubbles. Bake in the center of the oven for 1 hour and 15 minutes or until done. Let the cake rest in the pan on wire rack for 20-30 minutes. Carefully flip cake over and let cool for at least 1 hour. Melt butter in sauce pan over medium low heat. Once melted, add the coffee and turn heat to medium, stirring occasionally with wire whisk. Once liquid boils, gradually add confectioners sugar, stirring until dissolved. Stirring occasionally, let liquid return to a boil. Once boiling, continue to stir for a few minutes, until the glaze reduces and thickens. 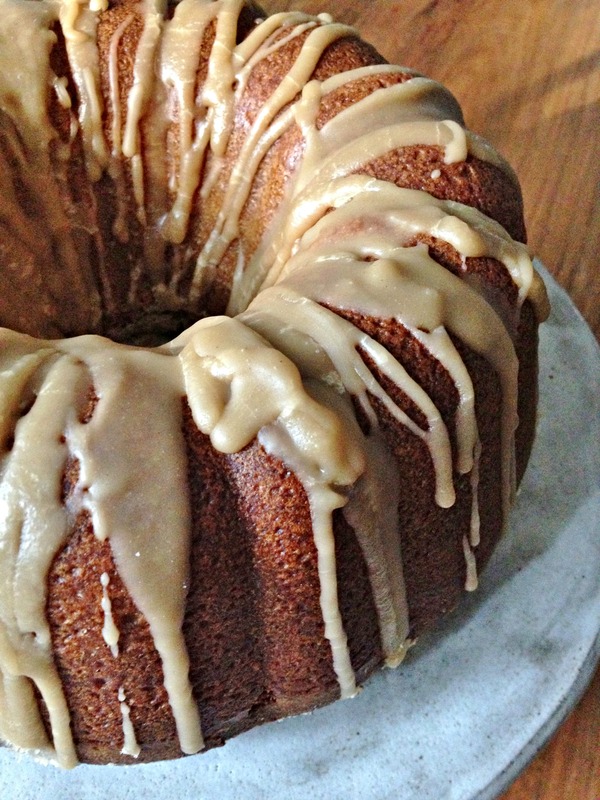 When glaze reaches preferred consistency, quickly pour the glaze over the cooled cake. (the glaze will harden upon cooling, work quickly!) 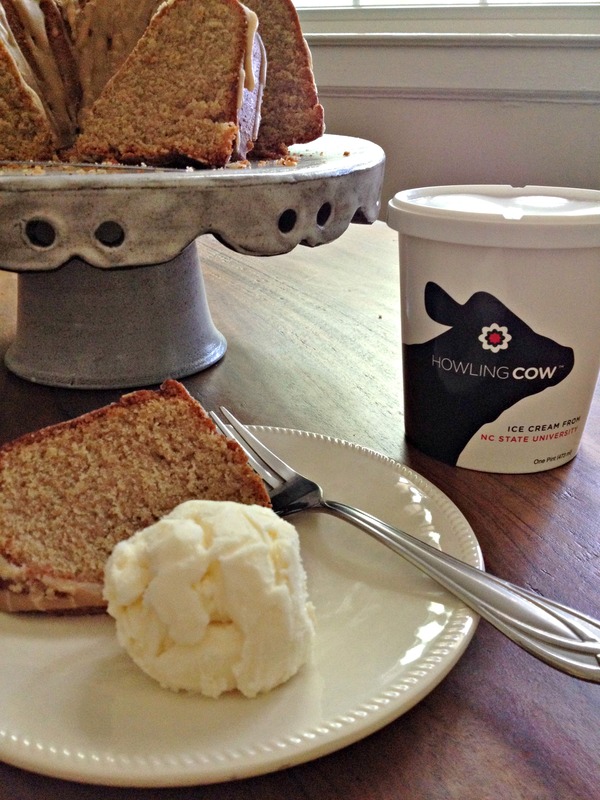 Serve with Howling Cow’s Vanilla Ice cream from N.C. State. Enjoy with family and friends! Optional: Pair with Oak City’s Kubum coffee or Raleigh Brewing’s Hidden Pipe Porter.